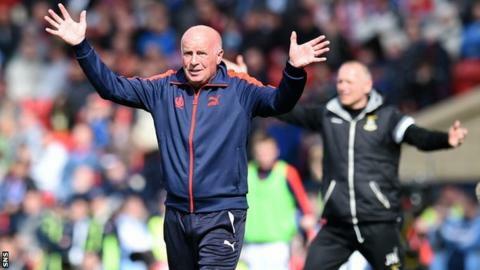 Falkirk manager Peter Houston urged his players to learn from their Scottish Cup final heartache and secure promotion to the Scottish Premiership. Peter Grant drew Falkirk level after Marley Watkins' opener for Inverness, but James Vincent was able to fire a winner for the 10-man Premiership side. "We were magnificent today and that's the standard," said Houston. "We want to play the Invernesses every week so we learn from it and try and get up." The Bairns, who finished fifth in this season's Championship, fell behind before half-time but dominated the second half. Carl Tremarco was sent off with 15 minutes left for Inverness and Houston believed his side would go on to win after Grant had headed the equaliser. However, Vincent pounced when goalkeeper Jamie MacDonald could not hold a Watkins shot, with the loose ball spinning into the path of the Englishman. "First half, we showed them too much respect, they dictated probably the majority of the first half," Houston told BBC Scotland. "But we changed it a wee bit at half-time and we became the dominant side. We were the team who looked likely to get the win. "I think on our second half performance we deserved more. We're disappointed with the second goal and a few players are in tears in there because of it." A number of Falkirk players also felt they should have had a penalty when the ball appeared to hit the hand of Caley Thistle's Ross Draper. Houston said: "[Referee] Willie Collum shouted to me 'it's 100% accidental'. I haven't seen it again but a lot of players were claiming for it. I've got to take his word that it was accidental and move on from there." He added: "We have progressed massively from the start of the season till now. We started really slowly, perhaps that's why we didn't get to the play-offs. "We have to start the season well. Hopefully we can bring in a couple of players and our main objective is to get back to the top division."